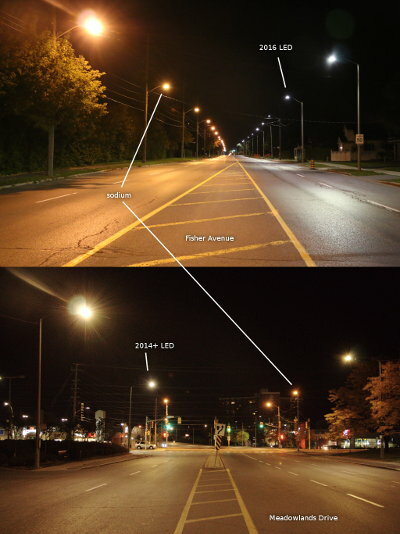 The City of Ottawa decided back in 2014 to implement a pilot project to convert the classic high-pressure sodium vapour street lighting on Carling Avenue to state of the art LED. All of the usual reasons were given, their energy efficiency being the main goal. The project went ahead, there weren’t many complaints, and the pilot was deemed a success. Fast forward to today, and the city is taking on the conversion to solid-state lighting all over the city. It’s an expensive project, but the energy savings is supposed to pay for it within four years. The problem is with the choice of bulbs they are using for the city-wide project. Here is some background. The high-pressure sodium vapour bulb, developed by General Electric in 1964, is a staple of street lighting. The warm 2700K wide-spectrum glow is easy on the eyes, not blinding to motorists, and also pleasant to sleep to when the light beams into your bedroom window from outside. Recent pockets of LED street lighting installations around the city have been a fair replacement for this technology; the LED’s colour is a little flatter, a little bluer in temperature (around 3000K), but overall acceptable as a replacement. The current project to convert all of the city’s street lighting to LED is, however, entirely different. The bulbs the city is installing right now are cool white, probably somewhere around the 5000K temperature. They are very jarringly white and easy to be blinded by when driving underneath them. Note how in the top picture the left side of the street has a pleasantly warm and inviting feel, while the right side of the street, with its newly installed lighting, is cold and pale. The other pictured intersection is Merivale and Meadowlands, which shows the classic sodium bulbs with the more fitting LED replacements mentioned above. These are clearly much easier on the eyes. How did it get to this? Whose ‘bright’ idea was it to use these horribly harsh bulbs in our street lamps? I sure would like to know why my tax dollars were spent on substandard lighting. Progress and energy savings are fine goals, but only if the progress actually results in something better.